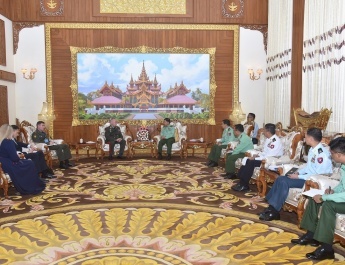 The Myanmar Tatmadaw goodwill delegation led by Commander-in-Chief of Defence Services Senior General Min Aung Hlaing, which is on a visit in China at the invitation of Member of Central Military Commission and Chief of the Joint Staff Department Gen. Li Zuocheng, accompanied by Commander of Hubei Provincial Military Region Maj.Gen. 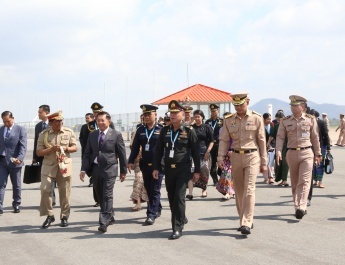 Ma Tao, and senior military officers of People’s Liberation Army of China, Myanmar Ambassador to China U Thit Linn Ohn, Myanmar Military Attaché (Army, Navy and Air) Brig-Gen Tint San and officials, visited Three Gorges Dam in Sandouping in Hubei Province this afternoon. 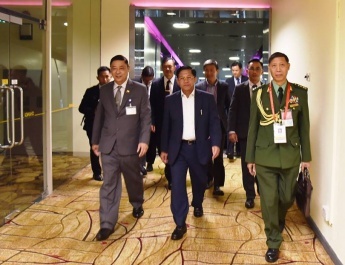 The Senior General and party were explained about construction of Three Gorges Dam with video records at Three Gorges Project Exhibition Centre. 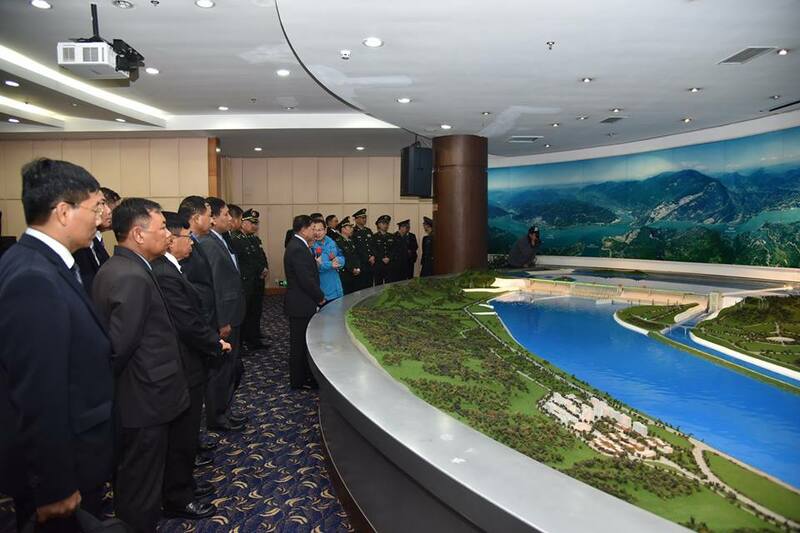 Then, they were conducted around the dam by Mr. Guo Mian Ming, the chair of technical operation section of Three Gorges Dam Management Department as they viewed the scale model of the dam, and documentary photos on construction of the dam at the exhibition centre, as well as the shiplock of the dam. On arrival at Three Gorges Left Bank Power Station, the Senior General and party viewed generating of electricity. Head of Electricity Generation Office Mr. Li Zhi Xiang conducted them round the power station. 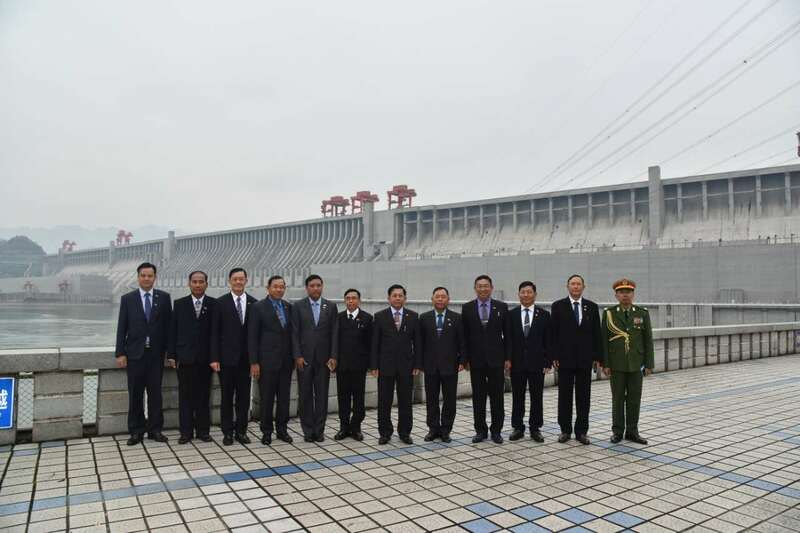 Next, the Senior General posed for documentary photo together with delegation members in front of Three Gorges Dam after signing the visitors’ book of the station. Three Gorges Dam is located near Sandouping Town, Yiling District, Yichang County, Hubei Province. State-owned China Three Gorges Corporation built the dam for controlling flooding, generating electricity and ensuring smooth transport in waterway in 1994. It is a concrete gravity type dam with 2,335 metres in length, 181 metres in height, 115 metres in width at bottom and 40 metres in width at the top. The facility can store 31,400,000 acre-feet of water. 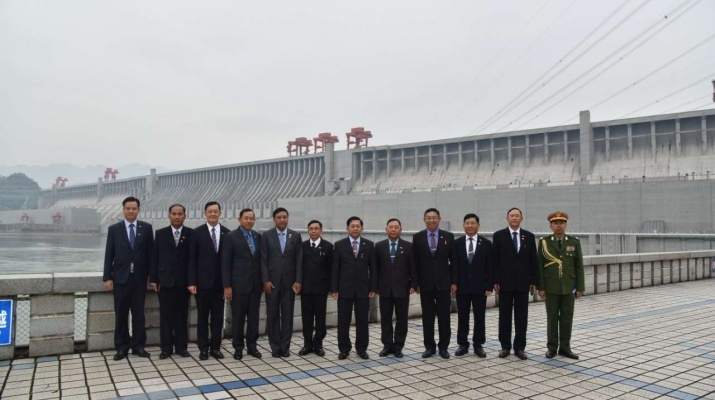 A total of 32 700-megawatt generators and two 50-megawatt generators are installed at the dam to generate 87 Terawatts per hour yearly for supplying 52 percent of electricity to the central area of the country, 32 percent to the eastern region and 16 percent to Guangdong Province. The Three Gorges Dam was installed with a two-way five-step system shiplock and a one-way one-step elevator for vessels to pass there. The dam was built at a cost of Chinese yuan 180 billion (US$-27.6 billion). 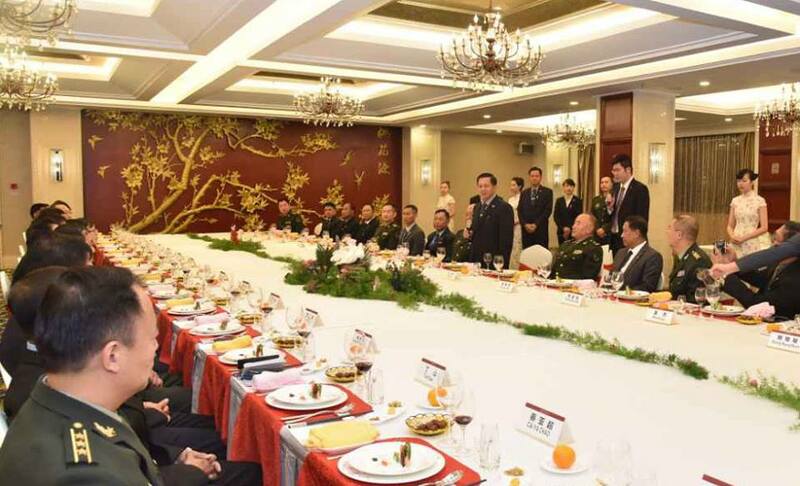 Afterwards, the Senior General and party attended the dinner hosted by Commander of Hubei Provincial Military Region Maj. Gen. Ma Tao of the Chinese People’s Liberation Army.